Clean and scrub your bird feeders, houses, and baths with a 10% bleach solution. This removes leftover winter detritus and reduces the chances of passing on parasites and diseases. Keep feeding birds if you are already. Birds are returning or migrating through and need precious calories to make the journey. Break out the birdbaths, but watch nighttime temperatures. Birds need water, but we may still dip down below freezing. 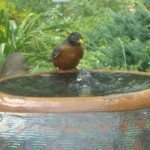 We don’t recommend letting birdbaths freeze as they can crack and chip, even concrete. Go slow on clearing out brush until spring growth is more apparent. Birds are gleaning the last of the fall seeds and berries, using twigs and stems for nests, and hiding from predators in your brush pile. As you cut your ornamental grasses back, consider cutting stems into smaller pieces and using it as mulch in your beds. Birds will appreciate the readymade nesting material and it adds another layer of organic matter to your soil. Leave your leaves. Loosen them with a rake if they’ve become matted, but many beneficial insects overwinter in leaf litter. Birds will forage in leaf litter for these insects as they emerge. Plus, some species of moths and butterflies overwinter as chrysalises among your perennials and shrubs.